Citizens impacted by a bicycle trail project on a Duke power easement supported by the Jefferson County Commission are raising questions and concerns about being left out of the approval process. Impacted landowners are also concerned about possible safety issues with the project that were not addressed. The eleven mile biking and hiking trail is the result of an agreement between Jefferson County and Duke Energy which will allow for the use of a rail easement. The project was approved at a January 3rd Board meeting. 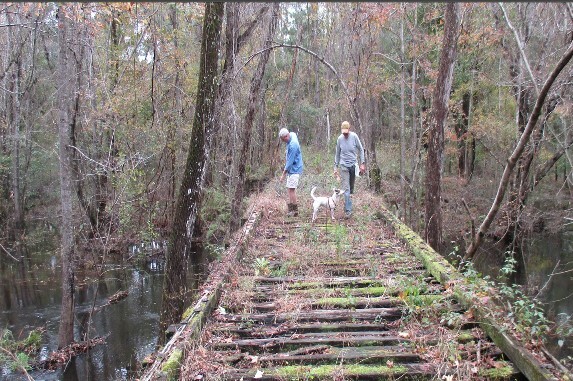 Lynn McGrady, a property owner impacted by the decision, told Tallahassee Reports that the project will change the rural character along the proposed trail and could expose landowners and local government to liability issues. McGrady said there is hunting on land around the trail and that could cause a lot problems. Also, McGrady had strong opinions about the process. The Jefferson County Commission voted 5-0 to approve the project at the January 3rd meeting. And while the issue was included in a meeting agenda, there was no notification to impacted landowners about the pending vote. Mr. Ward appeared at the meeting on January 3rd to raise concerns about proper notice, but Commissioner Barfield – supported by the Board’s attorney- said the meeting was properly noticed. TR spoke with Jefferson County Planning Board attorney Scott Shirley about the notice issue. Mr. Shirley said that impacted landowners were not officially notified because the law does not require a notice in this case. Shirley said a notice is not required due to the development parameters associated with the bike trail project. Despite the wrangling over proper notice, the overall view of a number of impacted landowners is that they were left out of the process and some make the claim it was on purpose. However, today a workshop on the project will be held and TR was told landowners will be well represented. This may be due to the fact that Jefferson County sent notices to impacted landowners about the workshop. Can the workshop impact the January 3rd decision? At the January 3rd meeting, Commissioner Eugene Hall, who voiced concerns about proper notice and eventually voted for the project, based his vote on the fact that a workshop would be scheduled. The workshop is scheduled for Thursday, January 31st at 6:30 at 435 West Walnut in Monticello. One Response to "Jefferson County Bike Trail Project Raises Transparency Concerns"
Bike trail —- what a joke !!!! Who’s getting the kick back? ?